Barnraiser started back in 2003 when I was invited to Kosovo to teach a group of students in entrepreneurship. I soon realized that these students have no access to tools to allow them to share knowledge and collaborate. I felt that these tools were essential for young people in Kosovo to share ideas, start businesses and move the country towards independence. Whilst there I wrote AROUNDMe; a small Free Software tool to allow them to social network, blog and search. It also had a forum and a wiki for groups to collaborate. The tool very quickly gained a small gathering of volunteer developers and from that the project grew. I was offered the opportunity to co-found a three year project to empower Swedish youth with the same tools. This project was fully funded and allowed for the employment of three people including myself. At the time, the thought of focusing on this project for three years was a dream, however it as a mistake. Whilst the project aims were good I found myself spending time with budgets, wages, organizations and most importantly, increasingly away from the founding objectives. The volunteers soon disappeared and we get caught up in code and business. Hindsight is a wonderful thing. What I should have done was continued to lecture and put time aside for Barnraiser or simply get a job somewhere with time to develop the project within work hours. My underlying objective was to see an open social networking protocol, so that people owned their social networks. Look at the mobile phone. It is yours. You have your contacts on it. It is irrelevant to you as too which network or service provider these contacts are on. My goal was that you can create a social network in any platform (website, mobile phone) and share information amongst friends. You can take it wit you from provider to provider... network ownership stays with you. I thought that the best project to piggyback on for this was the OpenID project. This takes care of identity. The social networking aspect would use OAuth. Using these two open protocols made sense to me. We could then take many small individualized softwares such as a personal blog, a group wiki or a twitter feel and share them amongst friends and groups of friends whom I wish to exchange interests and project ideas with. Meanwhile FaceBook grew and a monopoly was quickly in place. Whilst I wish the people at FaceBook all the best I find myself staring a monster in the face. A private company is now able to influence millions of people whom do not own their social networks nor have any say in what that company does. The FaceBook privacy issues highlighted this. One day we may see FaceBook either innovate open protocols or see a consortium lead by the mobile phone networks crush FaceBook. - who knows what the future will bring. Ola has gone on to work with LSU and I wish him all the best (and hope he takes some of our conversations to help other projects). Sebastian flourished as a developer and now with JamesList where he is up to all sorts of interesting things. I wish them both well and thank them both for their countless hours of sharing ideas and thoughts. As for me, I moved to Bequia; a tiny island in the Caribbean and now work for a Yacht Club. The schools in Bequia have no working computers so any thoughts I had of teaching technology and entrepreneurship here were scuppered. I\'ve now started a swimming school (swimming, snorkelling and diving is my other passion). As I teach the kids to swim we talk about rights, responsibility, social networking, open society, opportunities and music. They continue to teach me. I\'m happy taking part in them learning to swim - one by one. To everyone that supported Barnraiser, the volunteers spread throughout the world, those that downloaded, the Free Software Foundation and to all the students that I have had the pleasure to share my thoughts with, I thank you. It\'s been awesome – stay free. Added 8 years ago. 16 comments received. Add a comment. Share it. Tagged with Project closure . Permalink it. In this article I continue to publish the results of our usability tests along with recommendations for our software development surrounding OpenID implementation. This is a simplified workflow chart of a typical OpenID authentication process from a users perspective. The areas marked "A" through to "F" identity usability pitfalls that caught out a vast majority of our testers. From the top you see [Enter OpenID] which is a form field requesting the users OpenID identifier (typically something like http://tom.calthrop.info). The first time you authenticate from a browser you are asked to login to your RP (your OpenID service provider or "relaying party"). In some cases your session is stored so that you do not have to log in again for a limited time. The first time you authenticate to a website you enter a trust screen where your profile information is typically displayed. You authorize the transfer of this information back to the website. 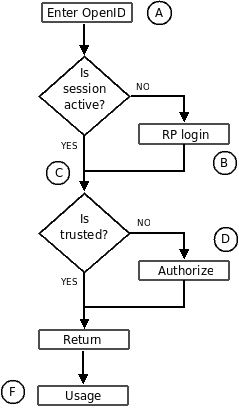 The typical form has options to "cancel" this authentication, "trust once" or "trust always". If trust always is selected the website is saved and you will no longer be presented with the trust screen when authenticating to this website. Once complete you are returned to the website as logged in. Typically if this is your first login to the website you will be presented with a registration form that is pre-filled with the information you supplied from the trust screen. We will now go through the process step by step and examine where each pitfall lies. At each stage I make a recommendation on how to avoid the pitfall all of which naturally I recommend built into Prairie; our Internet identity server if it has not already been done. See point A in the diagram. We found that around 40% of people at some point (normally after they had not used OpenID for a while) entered their email address as their "identifier". I discuss this in part 1 of this series together with suggestions for prompting the user if an email address is entered. See points B and D in the diagram. Users expect repartition in process otherwise you introduce points of variation which can lead to points where the user experiences confusion of frustration. The first point (B) often introduces some other decision point such as a "keep this session alive?" checkbox added to the login form. This adds confusion and misunderstanding. Recommendation: Only have the username and password field displayed in the login form. Remove any "keep session alive" option or move it to a user account "power options" area in the form of "display keep session alive option at login" which sets a cookie. Instead of a username ask the user for email and password. The biggest issue here in terms of confusion is the way the process sometimes takes you to the trust screen and sometimes does not. This appears random to the user as many of them do not understand the underlying process of storing trust. See point D in the diagram. When you authenticate you have the option of saving the fact that you trust this website. This means that in future authentication you skip the trust screen. As noted above this appears random. Add to this that you have to go into some form of account page to unset that trust once continuous trust is given and you uncover a minefield of usability chaos. Recommendation: Remove trust always and create a trust screen with two buttons; "cancel" and "proceed" on the trust screen which gives the user a clear and simple instruction to follow. See point D in the diagram. Apart from trust the greatest form of contention is with profile data. The user is more nervous about using OpenID because they see it as giving their identity away which is far more dangerous that giving a website their MSN password. Yes you read that right. Over 50% of testers felt this way. One of the main issues here is that their profile information is displayed to them along with big words like "trust always". Recommendation: Remove all profile information and extensions from the OpenID authentication process and focus on it being "a simple way to authenticate with a website". See point F in the diagram. There are no usability issues with a user completing the process and finding themselves logged in. This is important because it is the main purpose of why we adopted OpenID (to return me authenticated to a website that now sees me as logged in). When using OpenID to register wit a website many usability issues occurred. All users (100%) did not understand why they had looked at a form containing their profile information (in the trust screen), trusted or approved it only to discover that they are presented with a pre-filled registration form that contains all the same information as what they have just approved. Recommendation: We move all profile information exchange to OAuth under a different process. If the above is enacted upon we are left with a vastly simplified process that logs a user on quickly using one username (their email address) and one password. We talk of keys and certificates as technologists, but it just so happens that the vast majority of people who have a computer also have a key that they use everyday to let themselves into their house. Explaining keys to people is easy. Whilst the profile exchange in OpenID is messy a key exchange from an OpenID RP to a website to access RP profile information is easy technically with OAuth and easy to explain to a user from a usability perspective. Take the scenario that a website wants you to register. It asks you if you want to use your OpenID. You say yes and you are taken to your RP where you are prompted with "website X wants a key to look at your email, your nickname and your mobile number one time. Would you like to login and proceed?". You login then you get a screen where you can choose what to give the website. You press "proceed" and you are returned to the registration form. Behind the scenes OpenID authenticated and OAuth gave the website a use once key. The key was then used to access the profile information and pre-fill the form. This is an important difference in workflow because the website can for instance ask for a key to always look up your email address so that should you change your RP email address this address will be automatically updated by the consumer for the duration of the key lifetime. Having a process that does this presents other opportunities such as message exchange (a key that allows the website to forward messages to my RP) and commerce (allow Amazon to look up my credit card details) which naturally via my RP places me in command of my keys and thus in a higher degree of command for profile, communications and commerce information. I recommend that a different process is used for profile exchange and that OpenID is used purely for authentication at login. Usability notes. Once we removed the skip login and skip trust screens and removed all profile information in Prairie we got a 100% success rate in the number of authentications performed without question, hesitation or confusion. Added 1 decade ago. 6 comments received. Add a comment. Share it. Tagged with OpenID * Usability . Permalink it. I've never been presented to a person who forgot their email address. Quite a claim you may say, but when one presents themselves in business one tends to shake hands and hand over a business card with the email written on it. Next time you are in a meeting ask someone what their OpenID URi is. You'll probably get a blank stare followed by an answer along the lines of "oh, ehm, I only have Skype". The email address although geeky looking is now part of our daily lives unlike the OpenID URi, hence the challenge for those of us involved in developing OpenID solutions is to provide helpful usability centric solutions to this challenge. Given that, I challenged myself; can I provide an organisation with a mechanism to authenticate with OpenID but use the employees email address and email password? Here is my approach along with usability notes from testing. The first thing to notice is that they look alike to the average employee which gives them a great opportunity to confuse them. There is a far greater chance that they will forget their OpenID URi as it is not ingrained in their minds as with their email address. Instead of forcing them to learn their OpenID we should allow and forgive them for putting in their email address as their OpenID URi. We now had the URi back to the consumer and proceed with authentication as normal. With option 1 we have sort of shot ourselves in the foot because if your employees don't know that they have OpenID they do not get the full benefit of it (like being able to authenticate to an external website), hence my preferred method is to "guide" your employee in a helpful way. If you find something that looks like an email address then suggest to them an OpenID URi equivalent. On the OpenID server a form is included for the users password. Upon posting that we have both the URi (firstname.surname.openid_server_example.com) and the password. The password should match that of the users email password. Many companies and organisations use an LDAP directory to hold email username and passwords. Here is an example of how to check using LDAP. Please note the code is here to demonstrate the idea simply. It is not robust nor secure. The first bit of the email (firstname.surname) is the LDAP username so we need to get it. Once we have the username we can authenticate against the LDAP server. Once the username and password is checked as valid you can then continue with the OpenID authentication process as usual. As you maybe aware, we have a new OpenID server in our lab called "Prairie". We are considering adding the LDAP server. Please let me know if this is something you would want because if we get a good level of feedback we'll add it. Added 1 decade ago. 7 comments received. Add a comment. Share it. Tagged with LDAP * OpenID * usability . Permalink it. We have moved our web site today to use Roundhouse; our new social blogging tool. The community is also moved to http://build.barnraiser.org/ and is now built on Dutch; our knowledge sharing environment. Just add a comment either below or in the "barnraiser feedback" section of our community if you have any feedback. Added 1 decade ago. 4 comments received. Add a comment. Share it. Permalink it. I've rejected advertising in the past because of two simple reasons. Firstly anyone creating a social website should not have advertising as their primary revenue generator and secondly it does not work as a primary revenue generator. Taking Facebook as an example Valleywag.com reported that Facebook users click on an advertisement 0.04% of the time - yes, just 400 clicks in every 1 million views. This however does not stop the high level of questions I receive about advertising and using it to sustain a project or website. Given that I am intrigued as anyone I have decided to place Google adverts on our home page and build network. I will report back to you regularly with a status on that together with tips on how you can implement advertising in our product range. Any revenues gained from Google adverts will go towards the costs of our hosting. Added 1 decade ago. 1 comments received. Add a comment. Share it. Tagged with Advertising . Permalink it. Many people either working or volunteering for the organisation find useful snippets of information on the web. They in a moment of excitement send out an email to their colleges after which it is promptly trashed, forgotten and lost forever. Information harvesting is often overlooked by organisations. Finding, researching and cross checking from the web is an ongoing process. Often people involved in this share new ideas or thoughts sparked by information they harvest from the web. We wanted to create a tool that simplifies the catcher, retention and distribution of such information. We came up with Dutch; a knowledge sharing network tool. Dutch is a part of our research to re-think the way we share knowledge on the web. Our goal is to create a fluid pool of knowledge shared amongst interested people based upon them working together in gathering information from the web. If you are going to try it the best approach we've come up with is to gather your team and ask them which websites they like. If you are lucky as we were you get a wide variety of websites including social bookmarking, blogs and news services. Ask each member of your team to regularly post up information that they think will be of interest to the team. You should see pools of organizational relevant information form quickly. There is a demo available from the Dutch product page. I welcome your comments and thoughts on the tool. Added 1 decade ago. 1 comments received. Add a comment. Share it. Tagged with Dutch * Information harvesting . Permalink it.